Johan Teterissa, born 1961, was an elementary school teacher in Aboru village, near Ambon, before he was imprisoned. He is a member of the RMS and on April 3, 2008, was sentenced to life in prison for treason. His purported crime was leading 27 other dancers holding RMS flags to protest Indonesian rule on June 29, 2007, in front of President Susilo Bambang Yudhoyono at Merdeka Stadium in Ambon. All of the dancers were immediately arrested and taken to the police Detachment 88/Anti-Terror headquarters in Tantui, Ambon, where they were subjected to torture. According to Teterissa, Detachment 88/Anti-Terror police officers demanded that he sign a statement calling on the Moluccas Sovereignty Front (Front Kedaulatan Maluku, FKM) to disband. The FKM is a banned organization that promotes the creation of an independent RMS, and Teterissa is an FKM board member in Aboru, Haruku Island. He says that when he refused to sign the document, police beat him almost continuously for at least 12 hours every day for 11 days. Several beat him with iron rods and stones, and slashed him with a bayonet. 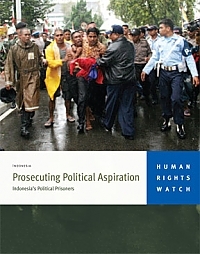 On June 30, 2007, four Detachment 88 officials beat him repeatedly with sticks and outside the unit’s office, kicked and pushed him down to the nearby Ambon sea, and continued beating him in the water. In another instance, officials kicked Teterissa out of a second floor room and down a set of stairs. Teterissa told Human Rights Watch that his chest was crushed, a number of his ribs were broken, and he was covered with black bruises. Ferdinand Waas, born in 1948, was an Indonesian Army officer, stationed in East Timor in the 1980s and 1990s. After his retirement at the rank of captain, he joined the RMS. He allowed RMS activists to use his house to plan the pro-independence dance at Merdeka Stadium in June 2007. He was arrested and in October 2007, an Ambon district court found him guilty of treason and sentenced him to ten years in prison. He was arrested along with the dancers at the stadium and detained at the Detachment 88/Anti-Terror in Tantui, Ambon. He said police officers beat him with billiard sticks, pieces of wood, and iron bars. “They knew I was an army captain, so I think they beat me harder, as if I was younger,” he said. Ferdinand Waas is in a state of heart pain and temporary in care in ICCU Room of the Public Hospital in Kudamati Ambon, as a result of torture and beatings inflicted upon him by Detachment 88. > see photo: His wife next to him in the public hospital. Saiya told Human Rights Watch that the Aboru villagers had decided to dance in a bid to protest their suffering in their own islands. “In the Moluccas, we cannot live a good life. We don’t get a good education. We cannot find work. The Indonesian people have taken over our islands,” he said. Admitted to hospital after vicious five-hour beating that left his left side immobilised due to fractured hip. Pierced with nails while placed in stress position. Only after four days of coughing blood and vomiting from pain was he given medical care. Pistol-whipped, kicked, punched, burnt with cigarettes. Forced to eat chillies. Plastic bag put on head until near suffocation. Told to tongue-kiss a fellow prisoner. ''They ordered me and Lodewijk to kiss each other''. Kicked and beaten at Detachment 88 post with sticks while blindfolded. Later attacked with dirty sandals. Refusal to engage in kisses resulted in being held in stress position with head bowed to floor and legs stretched wide. Beaten for more than five hours while blindfolded and mouth covered in plastic. Interrogators put his leg under a table leg and then jumped on it. Told to lie down and systematically hit with hard object across legs, arms, fingers and head. After breaking plastic bag, beaten in ribs, head, ears with wooden stick. Slapped with sandals and punched repeatedly. ''It was torture. It lasted more than a week''. Beaten in the mouth, ear, cheek. In hospital for two days, but on release beaten again during further interrogations. Forced to hold painful stress positions.